I am thoroughly impressed by this report – because it does not come from the Government, but from the brightest minds of India Inc. The report outlines steps that India needs to take for achieving 40 Million New Jobs and $200 Billion Annual Revenue by year 2020. The report also talks about the possible scenario’s that India can find itself by year 2020. If India is able to tap the sea of opportunities that are available and if government takes help of India Inc. Leaders, instead of relying on Babu’s, it will find itself as “Top Guns”, ! Despite a recession at the beginning of the century, developing countries have posted healthy economic growth rates over the last 15 years. These growth rates were maintained despite the ageing of the population in the developed world by harnessing energies of younger people in developing economies. The economic prosperity has also resulted in the global tourism industry registering strong growth. 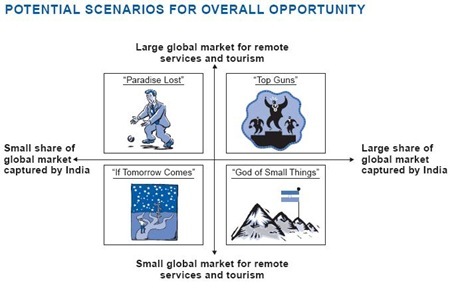 Realising the potential size of the opportunity in 2002, India put in place initiatives to tap it despite the uncertainty associated with the future. As part of its plan, India Inc. positioned its brand as a credible and value-for-money service provider, focused marketing efforts on select countries, and worked on improving the service experience of its customers. Enabling legal and regulatory frameworks were established, infrastructure was strengthened and the education system was reformed. And if India does not take the right path, it will find itself in quadrants that it does not want to be in.. I had written few articles couple of years back about India’s Young Population playing a pivotal role in carving India’s future, and this report outlines that in much greater detail and clarity. Here is the complete 56 page Report that you MUST read. If you do not have time Bookmark it for later reading ! Would love to hear your comments on the report ! I am interested in that report – I cannot find. COuld somebody send it to me please? Since when I surfed your site, I became a regular reader…the site is very informative and helpful for all the groups. what do you mean every thing changed. india is the best performing country during slow down of global recession . in 2009 first half india sold more cars and more cloths and more food and more phones than 2008 so india reaped even during global recession how will india perform when there is global bull come in 2012. Its was first released in 2003, but has been regularly updated since then, and is very informative even today. Is this a new document or is this the same one that has been floating around since 2003? If it is the same one since 2003, many things have changed.